The Rite? I would say more like, The Wrong. The wrong concept. The wrong script. The wrong idea. Art the Movie guy was educated by the Jesuits. I really believe in this stuff-–possession, the devil, the antichrist. So I bought into the basic theme of this film from the get go. It just went all wrong. Basically it was just boring. No film has captured the spine numbing freak out on the concept of possession and exorcism since the Exorcist in 1973. I wonder now if another film ever will. Relatively unknown actor, Colin O’Donoghue plays a doubting Thomas, American priest wannabe, Michael Kovak. His mentor sends him to Rome to give him a taste of the real thing. In Rome these days, apparently about three out of every four young people are either possessed, overly depressed, or they just spend too many hours high on weed at Iron Maiden concerts. The distinctions seem irrelevant. Kovak is dispatched to spend some quality time with Father Lucas Trevant. Trevant, (Hopkins) is the local famed exorcist. Even Rome apparently thinks he is more Hannibal Lector than honored priest as they make him live alone in a dump full of cats across town. Nothing makes sense here. 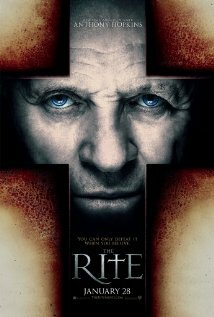 This film teaches nothing of the Roman Catholic Church. It offers no understanding or even fun myths about the practice of exorcism. It is not remotely scary unless you actually got spooked watching Paranormal Activity 2. In the case of the latter, you may well be possessed yourself and I suggest bathing in lots of holy water tonite. I was much more scared changing my first baby diaper than watching this film. This is just a bad film and we are sorry Sir Anthony needed the paycheck to appear in it.